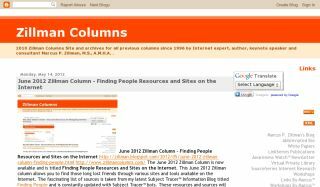 The June 2012 Zillman Column is now available and is titled Finding People Resources and Sites on the Internet. This June 2012 Zillman column allows you to find those long lost friends through various sites and tools available on the Internet. The fascinating list of sources is taken from my latest Subject Tracer™ Information Blog titled Finding People and is constantly updated with Subject Tracer™ bots. These resources and sources will help you to discover the many pathways available to you through the Internet to find those people that you have been looking for. Download this excellent freely available 25 page 218KB pdf column today and begin finding important people in your past and present environs!